Although the restaurant scene in BA is still dominated by traditional parillas (BBQs) and Italian restaurants, diversity is steadily growing and if you fancy a break from the steak and want a bit of spice to tingle your taste buds, make sure you visit some of the city’s great Peruvian restaurants. Peruvian cuisine is steadily gaining international recognition and even in beef-enamoured BA, you can find a decent fish ceviche and pisco sour bound to make you dream of nights in Cuzco. Citrus, chilli and corn make up the main components of Peruvian food and are a welcome break from the usual empanada diet. Although Argentines may comment that Peruvian food is insanely spicy, don’t worry – it is usually watered down to cater for the more tepid local palate. However you will, perhaps to your relief, find some good sauces likely to knock the socks off of any of the usual chimichurri available. Most restaurants hold the hot stuff on reserve for home-sick Peruvian expats, so be sure to ask if you want it even hotter. The real reason for coming to a Peruvian restaurant is usually the traditional fish ceviche (raw fish cut into small cubes and left to marinade and break down in citrus then added to onion and herbs). Many restaurants also offer seafood and mixed ceviche but if you can’t make up your mind which to try order the ceviche tasting menu and try them all! Chan Chan (Hipolito Yrigoyen 1390) comes highly recommended for traditional Peruvian cuisine that will appease your wallet as well as your tastebuds. Always brimming with people, there is barely space to pull out your chair, however this small restaurant is worth the squeeze. Great ceviche and fantastic prices make Chan Chan a local favourite. Nearby Status (Virrey Cevallos 178), Contigo Peru (Echeverria 1627) and Mochica (Aguero 520) also offer decently priced ceviche and all of them make good cracked corn, wicked papas a la huancaini (spicy potatoes covered in cream) and a variety of other traditional dishes. You are usually advised to swirl down your meal with a cold beer or a jug of pisco sour (the national brandy mixed with egg white, lime juice and sugar into a refreshing and boozy drink). 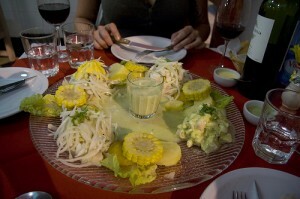 Another element to Peruvian cuisine not to be overlooked is the increasing number of fusion restaurants. More commonly fused with Asian flavours and specifically Japanese (raw fish being the obvious common element), some restaurants are branching out and working the key Peruvian principles with other cuisines including Mediterranean. Upmarket and good quality (although expensive) options include Astrid & Gaston (Lafinur 3222), Osaka (Soler 5608), Sipan (Paraguay 624) and Pozo Santo (El Salvador 4968). All of them are all great examples of chefs pulling out the best of the Peruvian and playing around with other flavours. However if you really want to see what the fuss is all about over Peruvian restaurants in BA, it is best to start with something traditional and you are bound to walk away wanting more. Thanks to aylwinlo on flickr. This page rendered in 0.863 seconds.